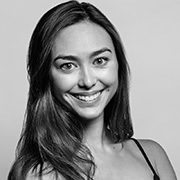 Chloe Leong started dancing at the age of six at Sydney’s Brent Street studios, and later studied at Lindfield’s Ecole Ballet and Dance Theatre. In 2010 she completed three years training at Rambert School. During her final year of training, she performed A Linha Curva by Itzik Galili with the Rambert Company for their National UK Autumn tour Seven for Secret. Chloe moved to Barcelona in 2012 to join the junior contemporary company IT Dansa under the direction of Catherine Allard. During her two years with the Company she performed works by Rafael Bonachela (Naked Thoughts), Alexander Ekman (Whim), Ohad Naharin (Kumyot) and Sidi Labi (In Memorium). Joining Sydney Dance Company in 2015, Chloe featured in Rafael Bonachela’s Frame of Mind and William Forsythe’s Quintett. Chloe won the 2015 Helpmann Award for ‘Best Female Dancer’ for her role in this piece. Frame of Mind also won the 2015 Helpmann Award for ‘Best Choreography in a Dance Work’ and ‘Best Dance Work’. Read more about Chloe’s time at Rambert School in our Student Stories section.